Bahujan Samaj Party (BSP) one of the major competitor in UP elections for all the parties and they have maximum chance to win UP assembly election in 2017. 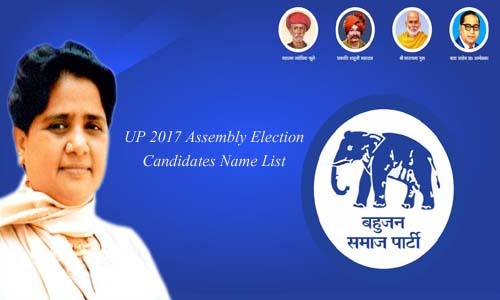 The BSP Superemo Kumari Mayawati has started the announced name list of the candidates and here on this page we have shared all those candidates name which are officially announced by the BSP party so that, you can get the confirmed candidates name list for 2017 Assembly elections. There are total 403 seats and party has confirmed only 08 candidates names well the official date of the election is not confirmed so far it may be reason party taking to much time to announce the name of the candidates so stay in touch with us for the complete and confirmed name list of BSP candidates name list for 2017 Assembly elections.